Cute, short video I saw on UniqueDaily, Besides making me grin, it also caused the secondary side effect of making me wonder what the heck is in string cheese to make poor Mr. Evil have that strong of a reaction. My third thought? Maybe I shouldn’t be eating the stuff for breakfast. 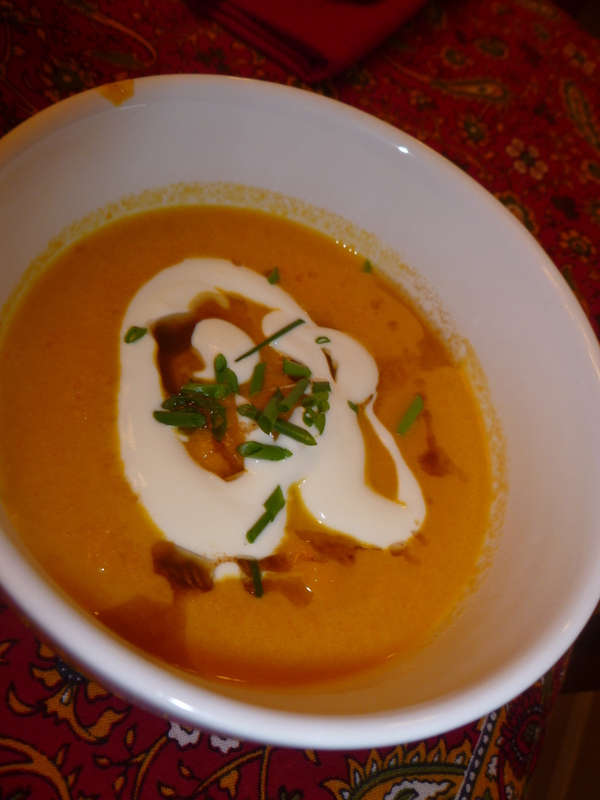 Feast your eyes, folks – quick, easy, delicious, AND nutritious! By the time I arrived home from the gym, I still hadn’t stopped sweating. I needed to eat something and to hydrate, so I did what any gal dining solo would have done in my place – I whipped up a miracle supper in (no kidding) about 8 minutes flat! 1. Fill the electric tea kettle and turn on to begin heating. 2. Put around a tablespoon of dried wakame seaweed into cold water to re-hydrate. 3. Dice 1/2 a shallot (or could use onion), two cloves of garlic, and a thumb-sized piece of (peeled) ginger. 4. Finely slice 1/2 a carrot. 4. Put a small saucepan on the stove and heat about a tablespoon of oil. Once hot, stir in the veggies and cook for about 1-2 minutes. 5. 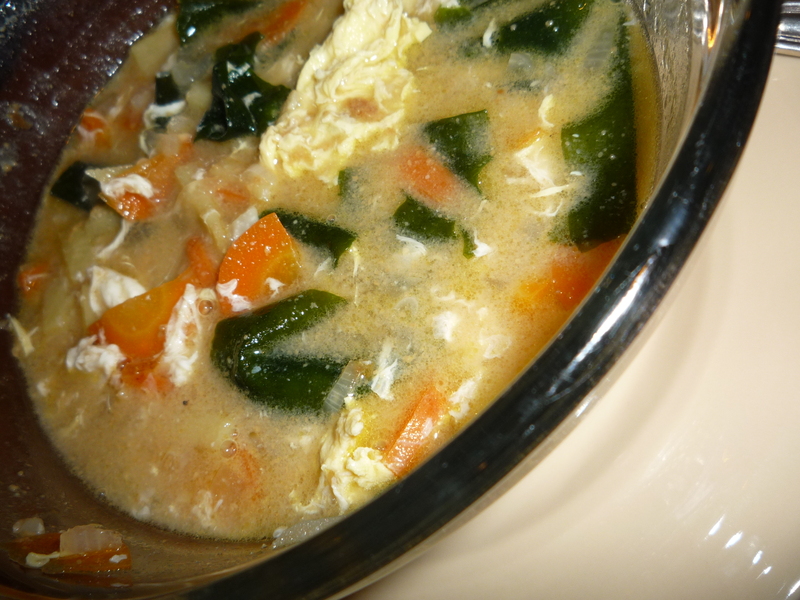 Water should be hot by now, pour about 2 cups in with the veggies and bring to a simmer. 6. Stir in 1-2 tbsp of miso paste (I used red). 7. Stir in 1-2 tbsp of nut butter (I used sunflower seed). 8. Simmer for another minute or so. Stir rapidly. 9. Crack an egg into the soup while the water is still spinning around, tornado style. 10. Squeeze out the seaweed to drain, and add to your soup. 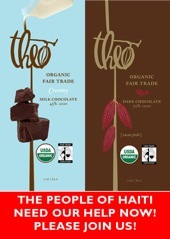 Theo Chocolate in Fremont is donating profits from two popular bars toward Haitian relief. The money from sales of both the Theo’s 45% Classic Milk and the 70% Classic Dark chocolate bars will go toward clean-water efforts by the NGO CARE. Cute video of squirrel monkeys enjoying an enrichment activity involving Jell-o containing blueberries. Surely, it must be significant that the monkeys demonstrate no interest whatsoever in the Jell-o, going straight for the “good stuff” and tossing the gelatinous bits aside without a second glance…This makes me consider – again – the true nutritional value of some of the things we put in our body…Sugar-free Jell-o is a “free” WW food, at zero points…Maybe a nice piece of fruit would actually be a smarter option? Snowboarding performance art. Watermelon included. This is the kind of video that makes me think it would be fun to live in Japan. This is from some kind of game show, and the challenge is to smoothly eat a slice of watermelon in such a way that the snowboarder taped to your face appears to be zooming back and forth on a half-pipe. Added bonus: Realistic sound effects!